During summer, ozone and fine particles from sources to our west occasionally degrade Yosemite air quality. Sometimes, smoke from local or regional fires also contribute. By the end of September though, ozone usually diminishes due to lower levels due to cooler fall temperatures, lower angle sunlight, and shorter days. Fires continue to occur in the fall before (or until) the rains come—as late as December in a dry year. 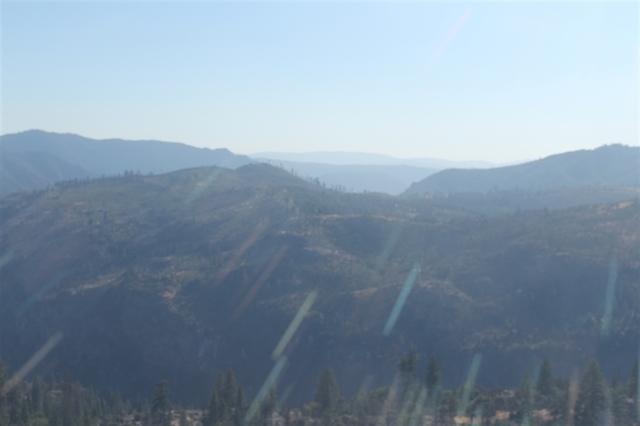 Check back and scroll down to see the most current information on air quality and smoke impacts in Yosemite. Yosemite National Park monitors smoke/fine particles and ozone as part of a nationwide effort to protect air quality and public health. Various agencies in California provide statewide smoke information. Current nationwide conditions are mapped below. NOAA also has a map showing smoke plumes. 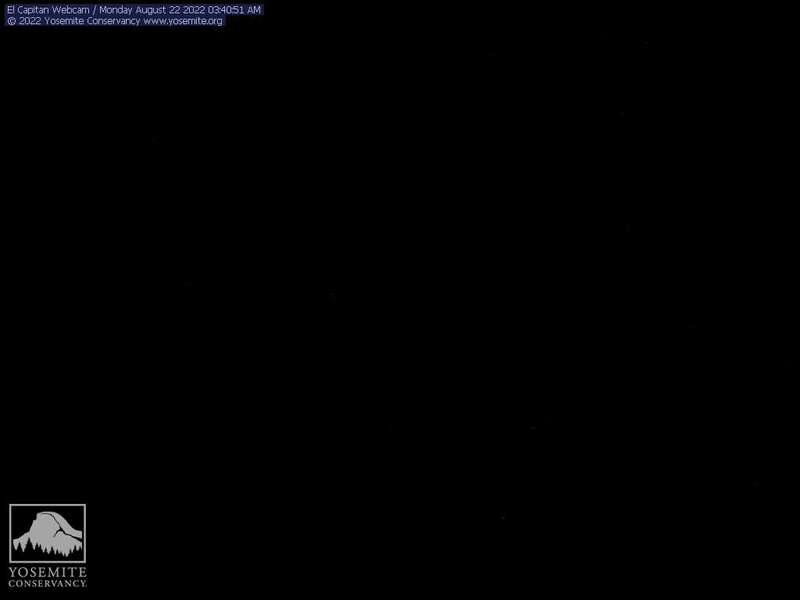 Wawona webcam, is looking south southwest over the Wawona area. 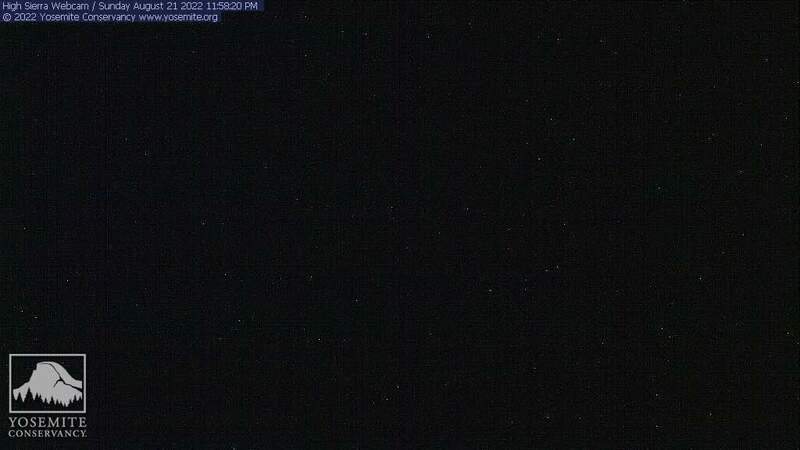 Past images of these webcams are also archived on the SWFRS web site. View current and recent particulate (PM2.5) concentrations at Turtleback Dome (just west of Yosemite Valley). While the graph plots both the 1-hour and running 24-hour average PM2.5 concentration, only the 24-hour average should be used to compare with the standard. The standard is exceeded when the 24-hour concentrations go above 35 micrograms per cubic meter. You can also view graphs from Yosemite Village and El Portal. Some Yosemite campgrounds have many campsites and campfires. Emissions from many simultaneous campfires can degrade air quality on a local scale. 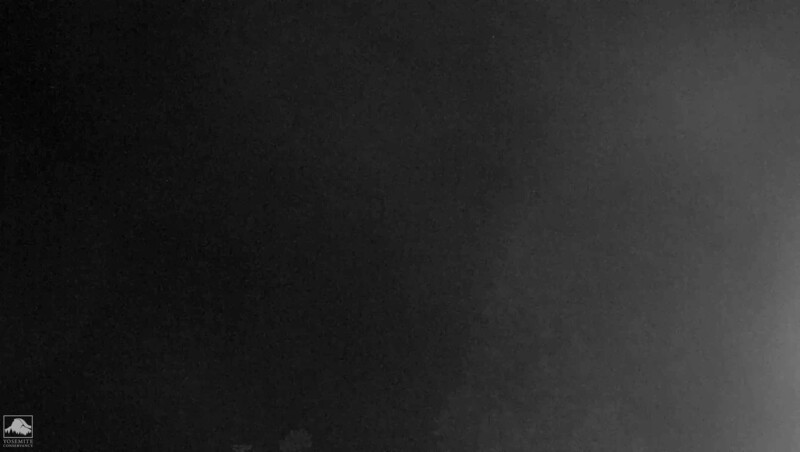 This is especially true in the nighttime and early morning hours, when inversions trap and concentrate fine particles from those campfires near the ground, creating local conditions that are potentially unhealthy for sensitive individuals. Because ozone pollution near the ground is usually only a concern on hot, sunny days, the ozone season runs May through September. Ozone is therefore rarely a human health concern in Yosemite during other times of the year. 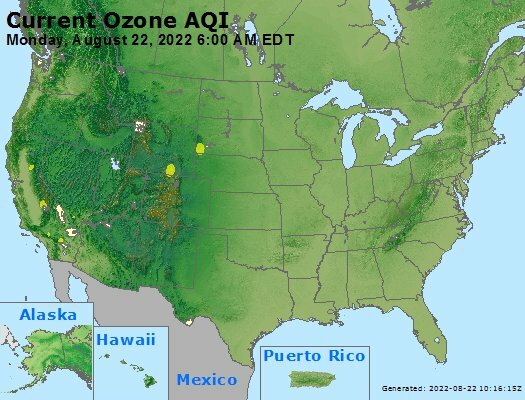 Learn more about ozone and its health effects at AIRNow.gov. Where in Yosemite is Ozone Usually a Concern? Historically, data show that ozone is worst in the Yosemite frontcountry (e.g., Wawona, El Portal, Crane Flat). At sites like these, ozone is often reaches levels unhealthy for sensitive individuals (asthmatics or others with respiratory ailments). 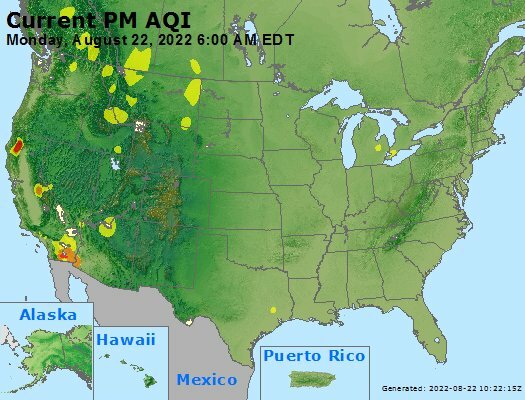 These unhealthy days often coincide with days that are unhealthy (Orange AQI) in the Central Valley, to the west, which is the primary source of this ozone. In more sheltered areas like the Yosemite Valley and remote, high-elevations areas like Tuolumne Meadows, ozone is usually much lower, and is rarely unhealthy even on most polluted of days. When is Ozone Usually a Human Health Concern in Yosemite? Highest levels of ozone on a given day usually occur in late afternoon and evening. If you have a respiratory condition, such as asthma, consult a doctor before exercising strenuously in frontcountry areas during late afternoon periods when high ozone might occur. Between the end of September/early October and May, ozone is usually not a human health concern in Yosemite. Yosemite has been monitoring ozone at three sites for several years now: seasonally in Yosemite Village and Glacier Point, and year-round at Turtleback Dome. View current and recent ozone concentrations at Turtleback Dome (just west of Yosemite Valley). The chart shows both the 1-hour and running 8-hour average ozone concentration, but only the 8-hour average should be used to compare with the standard. The standard is exceeded when the 8-hour concentrations reach or go above 70 parts per billion. The National Park Service tracks the days when the ozone standard is exceeded in the parks. Click to see today's NASA satellite imagery of the Yosemite area. MODIS satellite imagery often captures plumes from large fires via high-resolution (250m), color images of the Fresno/Yosemite area (2 images per day). Download fire maps and fire perimeters from GeoMAC's (Geospatial Multi-Agency Coordination Group) federal mapping tools.